Comprising only 1 to 3 percent of the United States population, the upper class holds more than 25 percent of the nation’s wealth. This class divides into two groups: lower-upper and upper-upper. The lower-upper class includes those with “new money,” or money made from investments, business ventures, and so forth. The upper-upper class includes those aristocratic and “high society” families with “old money” who have been rich for generations. These extremely wealthy people live off the income from their inherited riches. The upper upper class is more prestigious than the lower upper class. Wherever their money comes from, both segments of the upper class are exceptionally rich. Both groups have more money than they could possibly spend, which leaves them with much leisure time for cultivating a variety of interests. They live in exclusive neighborhoods, gather at expensive social clubs, and send their children to the finest schools. As might be expected, they also exercise a great deal of influence and power both nationally and globally. The definition tells us a lot, I think, about how Americans like to think about class. Class is a state of mind, not merely a measure of wealth. This psychological element explains the complete abandonment of all objective measures when talking about wealth. Take for example, Robert Reich, the former Labor Secretary, who very much likes to remind people that the top 400 families today own a greater share of the country’s wealth than everyone in the bottom half of the country combined. It sounds awful. And scary. But what Reich must know, but doesn’t dare say, is that this has always been the case. Why? Because the bottom half of the country has always had basically no wealth at all. That’s right. The entire bottom half of the country is and always has been flat broke. So, it’s true that the top 400 have more wealth than the entire bottom half of the country combined. But it’s also true that just about any section of the top 50% have more wealth than the bottom half combined. Now that’s scary. Saez and Zucman don’t spell it out in their paper, but they are hiding a huge amount of inequality by lumping together the 50-90%. No doubt, just as most of the wealth in the top 1% is concentrated in the top .1%, most of the wealth in the 50-90% group is also concentrated at the top. Saez and Zucman estimate that the 50-90% group own 22.8% of the country’s wealth. The 80-90% probably own at least half of that, and the 50-60% group a negligible 2.5% or so. What this means is that the country is not really divided into three comparable classes (lower, middle and upper), but rather two: the haves and the have-nots. And, as I will explain further, wealth inequality is really only an issue for the very upper stratum of the haves. The vast majority of the country basically never has had much wealth and probably never will, regardless of what tax policies are adopted. The “class” terms are being misused to create a sense of mistaken solidarity among everyone who does not feel super-wealthy. The percentages are just arbitrary numbers really. The fundamental issue is the psychology. For example, Bill Gates has 1,000 times the money that I have. So if I want, I can consider myself poor with only .01% of what Gates has, or I can look back the other way and feel rich, realizing that I am wealthier than 99.95% of the country with a net worth that is 1,000 times the average of the Bottom 90%. If the first number changes dramatically, and I am now only 1/100th of Gates, it doesn’t really change the psychological aspect much. The same is true for most of the people in the top quintile of the wealth ladder. They are far, far ahead of just about everyone, and yet still feel like they are falling behind. The idea of class is more a psychological problem inherent in every non-Communist system than it is a function of the actual distribution, I think. Measuring wealth inequality in America is not easy, because we really do not try to collect data that would allow us to easily measure the distribution of wealth. Saez and Zucman therefore arrive at their estimates based on studies of income and estate tax returns. As I have discussed before in connection with Warren Buffett, who invests almost exclusively in assets that produce no income, income is not always correlated to wealth, so looking at tax returns of the super-rich can often be misleading. But lets assume for the moment that Saez and Zucman have correctly figured out a way to calculate wealth in America. The results of Saez and Zucman’s research indicate that “the top 10% wealth share peaked at 84% in the late 1920s, then dropped down to 63% in the mid-1980s, and has been gradually rising ever since then, to 77.2% in 2012.” But the somewhat arbitrary focus on 10% masks what is really going on. 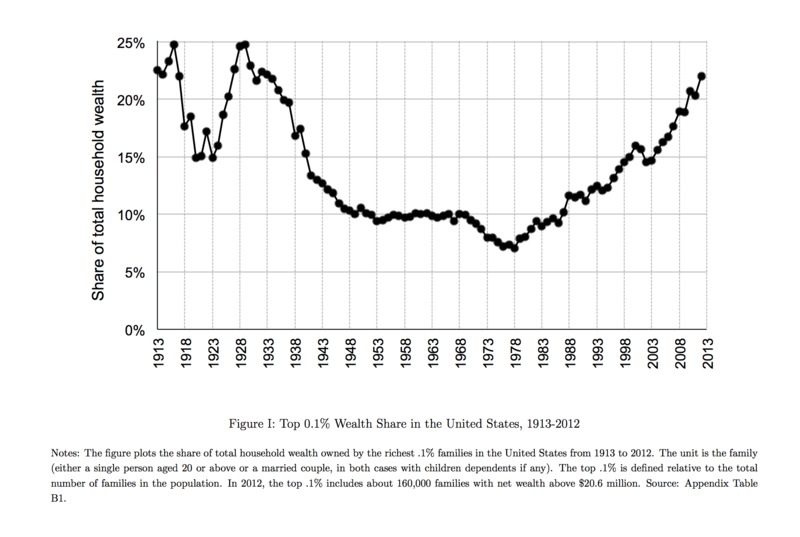 If you look at the right side of the graph below, you will see that in 1983, the Top 10% to 1% held 40% of the wealth and that this figure declined to 35% in 2013. The gains were all at the top, with the Top 1%’s share growing from 27% to 42% in the same 30 year period. 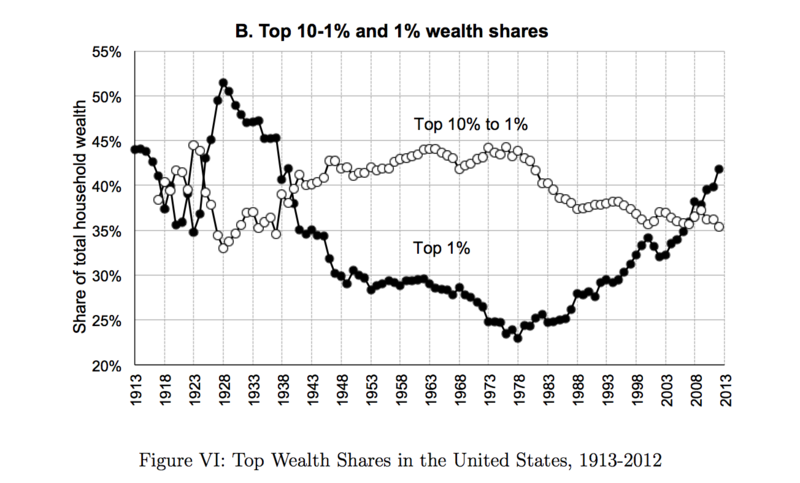 Similarly, even within the Top 1%, the lion’s share of the increase is in the Top .1%, as this graph demonstrates, showing that the share of the Top .1% has grown from 9% to 22% from 1983 to 2013. 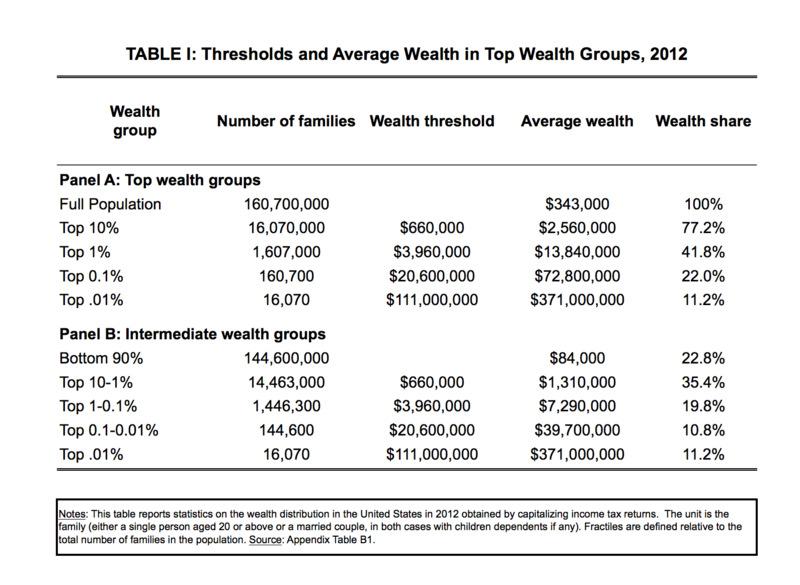 As Saez and Zucman conclude, in 2012, the top .1% included about 160,000 families with net wealth above $20.6 million. No doubt this could be carried out further, with the Top .01% accounting for nearly all of the increase of the Top .1%. Etc. So, what is really going on? What we are witnessing is not a general trend toward wealth inequality affecting large numbers of Americans, but rather a huge increase in the wealth of the very, very top, without much change in the lower 99.9%. The more refined the top sample is, the more evident the trend. We can see it reflected in the Forbes 400 List, first published in 1982. In the first list, the top spot was held by Daniel Keith Ludwig, with a $2 billion fortune, or about $4.8b in 2012 dollars. Today, Bill Gates is at $75b at the top of the list (even after giving half of his fortune to his eponymous foundation). The distortion caused by the disproportionate increase in wealth at the very, very top accounts for most of the changes in the distribution of wealth throughout the rest of the population. Saez and Zucman note that the total wealth share of the Forbes 400 (normalized for population growth) has tripled from 1% to 3% over the past thirty years, as has the entire Top .01%, from 3.5% to 11%. Saez and Zucman focus primarily on the Top 10% of the population and do not provide data for any of the lower strata, which makes it much more difficult to see how little the change in wealth distribution is affecting the Bottom 90%, who have collectively an average wealth of $84,000 per family (a figure that masks the fact that the average wealth continues to drop precipitously, so that nearly all of the wealth of the Bottom 90% is held by the 80-90% stratum). But the chart does illustrate how much the upper .01% (16,070 families) are influencing the results. To put things a different way, 1/1,000th of the Top 10% has over 1/10th of the wealth in that category, or more than 100 times what you would expect if the distribution were even. Is this a bad thing? Is it unexpected? Or, asked differently, is there a different, fairer way that enormous increases in wealth could be achieved? And who would benefit? Certainly, we could bring back much higher income, capital gains and estate taxes, as in the past, or even wealth taxes, as has been attempted in various countries. This would provide a barrier for those trying to amass great wealth, and might also decrease the net worth of those at the top. But how much would this really do to alter the distribution of wealth? The results of Saez and Zucman’s research demonstrates that the Bottom 50% would still have essentially zero wealth. Indeed, the Bottom 90% would hardly expect to notice any difference. The debate over wealth inequality is really a champagne problem, affecting only the psychology of the upper class, which is how I would characterize the Top 10% of families, those with at least $660,000 in wealth. One of the problems I have with Sanders and his rhetoric is that he makes people think that wealth inequality is a problem for the 99% of the country that isn’t in the 1%. If we’ve learned anything from the rise and fall of Communism, it is that attempts to equalize wealth can quickly get out of hand. What happens when we bring wealth inequality back to 1983 levels and no one notices any difference? The rich are still rich. The vast poor are still poor. The top of the wealth ladder is still unattainable, whether it is $1 billion, $10 billion or $100 billion. Absent a decision to end personal wealth and adopt Communism, with all of the coercion and tyranny that is required to maintain equality, we are always going to have wealth inequality. The bottom 50% will have nothing and everyone else will be looking up at the people above them on the ladder, wondering how he can climb higher. Of course, we tolerate inequality in all sorts of ways and don’t always call it “unfair” or “rigged.” Is it fair that a 7 footer has a better chance of playing in the NBA (and earning millions of dollars) than folks of ordinary height? Is it fair that people who are older have more wealth than people who are younger? Is it fair that people with high intelligence find it easier to get high-paying jobs? It might not be, but then again there’s not much we can or should do about it if we want to allow people to be different. Inequality is a fact of life. And much of the increase in wealth at the top of the wealth distribution is certainly the result of increased market efficiency, which allows individuals with popular inventions to amass enormous wealth very quickly. Think Mark Zuckerberg, who at age 31 is worth over $35 billion. His wealth is the result not of a rigged economy, but an incredibly efficient one, that allows exploitation of the herd mentality of the entire population desiring the same products and services. Saez and Zucman do not address the effect population growth might have on wealth distribution. It would seem obvious that the distribution of wealth is not even over the increase in population. In other words, immigrants are more likely to be very poor and the poor also tend to have higher birth rates. Therefore, you would expect population growth to distort the wealth distribution by shifting wealth toward the top. The impact of population growth on measures of wealth inequality deserves to be looked at more closely. The most we can ask, I think, is that people who are fortunate enough to have advantages be aware of their good fortune, and not pretend that they don’t have advantages. One downside to the ridiculously skewed way we define “upper class” is that we don’t get the type of honesty we deserve. People like Robert Reich or Bernie Sanders might not feel like they are upper class, but by any estimation they are. Robert Reich’s net worth is estimated to be $4 million, which puts him in the Top 1%. Bernie Sanders’ net worth is estimated at $528,014, not very far below the $660,000 wealth threshold for the Top 10%. When he rails against the Top 1%, he is doing so as a member of the lower-upper-class, with a wealth greater than 85% of the families in this country, most of whom have nothing. There are many wealthy people, and I am one of them (and so is my doppelgänger Eric Schoenberg), who agree with Sanders and Reich that we at the top can afford to share more and to pay more taxes. I also think it is in our best interest to do so. Indeed, as I pointed out in my blog on Warren Buffett, enacting barriers to extreme wealth creation is the best way to ensure that a rich person maintains his place on top of the wealth ladder. But because of this we need to be sure not to raise expectations that cannot be fulfilled. Ending wealth inequality is not going to happen. Redistributing wealth from the top is probably not going to make people happier, at least not directly, or bring them closer to the top of the wealth ladder. What is important is what we do with the wealth that we tax, what services we provide to improve the lives of the vast, vast number of families who will never have any wealth at all.